Editor's note: This is a guest post contributed by Kali Greff, marketing manager of BlogMutt, the simple, cost-effective blog writing service for marketing agencies and businesses and happy partner of GreenRope’s. BlogMutt and GreenRope teamed up for an info-packed webinar on the relationship between content and marketing automation and how each can amplify the other. We’re excited to share those insights in blog form, here, and via webinar recording (access here). What does ‘developing content’ look like for your company today? Do you get a blog post published every once in awhile? Do you put together an email or social media campaign around a new piece on occasion? How does this output or process differ from what you want it to be? The fundamental question this boils down to is: how much of your marketing team’s time is actually dedicated to content development AND promotion? If your organization or company isn’t thinking about content as an ongoing, sustained effort, with a marketing automation system as the essential amplification method and knot tying your entire marketing strategy together, then, frankly, you’re just not doing it right. If you find yourself in this bucket, lucky for you, that’s what we’re here to cover. In partnering with GreenRope, one of the leading and most comprehensive CRM and marketing automation platforms out there, we at BlogMutt are excited to cover exactly what elements of a content strategy can take it from flat and lifeless and dynamically bring it to life and start actually accomplishing your marketing goals. Only when we have a clear sense of this question and why it’s foundational for your organization or company can you see the inherent value in it (and build upon it). Content enables you to stay competitive in the digital landscape. To be competitive today in almost every business (that includes e-commerce sites, medical experts, and forklift technology professionals alike), you have to be online. And to be competitive today in online business, you need to be developing consistent, relevant content. And to be developing consistent, relevant content for your business, content, and promotion of it must be focused for successful marketing. And getting that initial first impression from the first click from search isn’t the only instance in which content is helpful to marketing. Content keeps on giving by effectively fostering and educating online users through the buying cycle, and around the clock when employees have since gone home. By educating and informing buyers at various stages of buying and gently encouraging action through CTAs (calls-to-action), on-demand content makes for a more pleasurable user experience for online consumers, more so than the over-the-top, force-feeding sorts of sales tactics that predate it. Plus, you’re in good (not to mention smart!) company if you’ve made content a priority. Many are rating it among the top marketing techniques of 2017, and 60% of marketers are even creating at least one piece of content each day. Content establishes essential positioning for the business, by the business. It may sound like paranoia to want to control the conversation about your business over the internet, but in the age of user reviews and bloggers reviewing products and services which can (and do!) sway the perception of a company/product in the public eye, this is a prudent, future-looking move. Craft the way you want your product or services to be perceived, in your own brand voice, and skillfully work that messaging into your content. But the bigger question becomes...how can that content speak as loudly as possible in a very saturated content marketplace? In exuding helpfulness, chiming in with unique educational value or thought leadership in your area of industry expertise or product, and doing it in the form of storytelling when appropriate, you’ll not only get the eyeballs you want to on your content, but keep the eyeballs interested in your business and what you have to offer well past reading the first piece. Content drives marketing automation efforts--effectively. So it should come as no surprise that successful and effective marketing automation strategies rely on content, and new content being developed...all the time. But there is good news here. Despite the fact that developing content entails more long-term effort and time when compared to other modern marketing tactics, it is markedly less costly and…will pay out in handsome dividends while positively changing your business when paired with marketing automation. Marketing automation streamlines and makes content distribution process easier, and all while driving leads down every part of your funnel with personalized, relevant content presented at the right times. What are your top marketing goals this year? Spoiler alert: Content helps with every. single. one. Yes, those all sound awesome, right? Who wouldn’t want to accomplish all of these? But--be careful--we recommend you choose only 2-3 to focus on most highly in dedicated, upcoming monthly sprints, or to really narrow in on in the coming year, otherwise, your attention will become too scattered to do any individual one well. And content and marketing automation will be your go-to superhero duo to make any of these happen for your company or organization. Alright already, you’re saying. I get it. So here’s actually how to get it done. Exactly how do content and marketing automation go together? We’ll break it down by stage in the customer funnel, which undoubtedly you are familiar with in some shape or form in the context of your unique business and customer conversion lifecycle. We measure content’s success in terms of customer conversions (or donors, or patients, or whichever is the case in your business’s terms), because, well, what better metric out there is better to actually gauge success? It’s simple: in fostering customers through the stages of buying--that is, awareness, consideration, and conversion--content is the means by which you can efficiently usher customers through. How do you properly qualify and usher customers down the funnel, then? An action (by a lead/customer) can trigger a piece of content (one of these pieces) to be delivered to that contact at every stage of the funnel. It is the actions and engagements that the contact takes which should determine when/at what stage in the funnel he/she receives it. In the awareness stage, the primary goal is to generate leads with more broadly-applied keywords or blog posts by collecting their contact information. In the consideration stage, the primary goals are to nurture leads, build trust and familiarity with your company, and address further questions on how your product or service will best meet their needs. In the conversion stage, the primary goal is...as you’d expect it to be...converting leads to customers. Without content, marketing automation isn't effective and without marketing automation, putting this content into the right hands at the right time becomes a manual, lengthy process. So which type of content is right to present at each stage of the funnel? Truly, this depends mostly on your customer, service/product, and audience, and then, secondarily, which stage of the funnel they’re in. How can you develop & deliver quality content? Without a doubt, the optimal content team is a minimum of two in-house writers. But so many small to medium-sized businesses don’t have the budget or scope of work to keep each of these individuals busy and working full workdays. The answer: The crowd. By tapping a crowd, you immediately gain access to thousands of talented, diverse writers with a wide variety of experts who seek flexible and interesting work...a crowd like that of BlogMutt--the simple, cost-effective blog writing service platform for businesses and marketing agencies. “GreenRope's experience with BlogMutt has been nothing short of great. Between the setup to creating topics, receiving content, and so forth, the process has been seamless, quick, and successful. We have now requested 4 blog posts and signed up for a yearly subscription. I had always been skeptical about using third-party content writers because of our niche [CRM software], however, the posts that have been submitted are professional and showcase real knowledge of the topic I requested. I love that you can share articles, blog posts, [links] etc. with the writers to help give them more of an idea of what you are looking for. Showing is much more effective than telling a lot of the time. I have only rejected one post at this point and it was completely due to my lack of detail in the topic request. The more detail the better, I've learned, and it has worked. At GreenRope, we have a limited marketing team, which means we really need to leverage platforms like BlogMutt to help us create a consistent stream of relevant content for both our users and lead generation. With BlogMutt, we can create content for each stage of our funnel, which frees up our time to really push the distribution phase and focus on our overall strategy. Got more questions before checking off the critical checkbox for content (using BlogMutt, of course)? Of course, you do. This blog post can help answer ‘em. How can you develop and effectively use marketing automation to power your overall marketing strategy? The pain point here is creating and distributing your content, and because marketing automation is driven by content, the content you distribute is critical to the effectiveness of your marketing automation strategy. First, comes the content, then your marketing automation. This means you need capable content writers to deliver consistently converting content that you can use in your marketing and MA plan. And the crowd, in this case, is the mass of leads and customers who are craving content that informs and educates to ease the burdens of business concerns and challenges. Marketing automation is meant to be personalized, delivering the right messages and at the right time. Many companies have more than one buyer persona and of course, their needs are different at each stage of the funnel. This means you need content that addresses each stage as well as each persona at those stages. The solution? 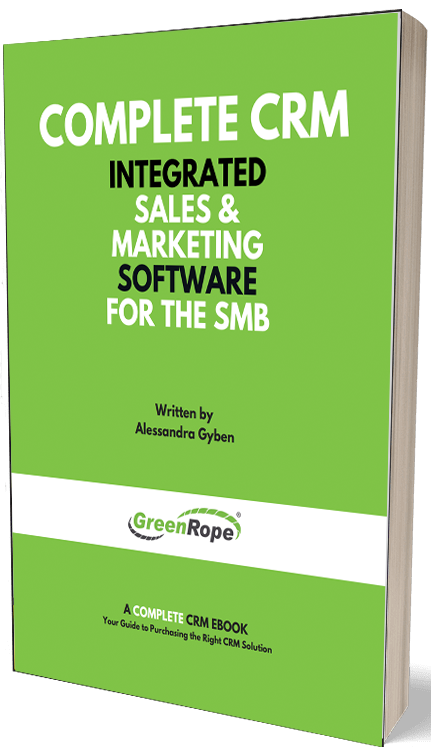 GreenRope, the integrated CRM & marketing automation. Data should drive both your content and your marketing automation strategy. Data not only tells you demographic information about your audience, but it also tells you what they engage with and the types of content they are most interested in receiving. Use data from your CRM to help determine the type of content you need. Create different forms of content to be delivered at different stages in the buying cycle. Content should get more specific and product-focused as you move down the funnel. Automatically communicate and engage your leads and customer with timely messages that improve their overall experience with your brand and helps them succeed. Marketing automation is a strategy over anything else. It takes careful planning, execution, and testing for to reach max engagement and conversion. It’s a marathon, not a sprint. When paired with automation, you can make its impact exponential. Best served up as useful, educational, and in storytelling form as possible, not salesy. Also a marathon, not a sprint. It takes time to establish the different types of content based on your buyer personas and stages in the sales funnel. Test, test, test. Find out what messages work and where in your customer journeys they resonate best (with metrics to serve as your test findings). Build customer journeys to help you execute on this messaging. Given the important role content plays in your overall marketing strategy, you as a small business owner sometimes feel like an underdog when it comes to developing an online presence. You face three big marketing challenges: 1) no reliable, cost-effective writers with industry expertise or local know-how to write, 2) uncertainty on how to tap in and get started or begin reaping the SEO/ROI/marketing automation benefits, and 3) no time to do it, much less do it well. BlogMutt solves these.